If you value the nutrition that your cat gets every day, then you have to check out Purina’s premium cat food brands. And for a limited time, Purina is offering a good $1.75 off on your purchase of Purina One Healthy Metabolism Cat Food with a coupon. 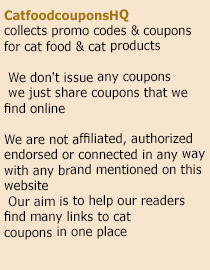 Get your discount coupon straight from Purina’s website and give your cat the real meal that it deserves. The coupon is valid for 1 bag of the Purina One Healthy Metabolism Dry Cat Food and 2 cans of Purina One Healthy Metabolism Wet Cat Food. This exciting offer will give your cat a week-long real meal spree, which you can get at a good discount at that. Simply go to Purina’s website and grab the coupon via their Digital Rewards page. coupon (this coupon has expired – check the new one below) is ready for printing. Just click the appropriate buttons to download. That’s how easy you can give your cat a healthier meal at a discounted price. Purina has been one of the highly respected names in cat food as their formulas are known to provide optimum health and nutrition to pets. Try their all new Healthy Metabolism variant and turn your chubby cat into a mean and lean machine today. Hi Kayla, I just posted a few new offers for Purina, Fancy Feast and Rachel Ray -check the latest posts. Also be sure to follow our facebook page as all the offers are posted there as well. thanks for the comment!